My dad and I share a knack for dragging people on absurdly long walking trips. My college friend Kim came to visit San Francisco a few years back, and I dragged her up and down Market and all over the Embarcadero. It may be a threshold of pain sort of thing—I can’t stand stubbing my toe, but I can walk all day, much to the detriment of my company. And so it came to pass Luisa and I walked somewhere between 8 and 10 miles today. I looked it up on GoogleMaps this morning, and it turns out the place we’re staying is only 10 kilometers from downtown Sydney, and I suggested we do it like an urban hike—we’d get to cross the Harbour Bridge. Luisa was all about it. In fact, she suggested we run it. I blanched at that idea, so we took it slow. It’s kind of fun staying in Sydney’s ‘burbs. Australia’s western colonization took place just slightly after America’s, and the areas north of Sydney have a similar feel to suburbs along the American east coast. Roads are sprinkled with tidbits and factoids about when and why bridges and buildings were built, and the architecture of older buildings echoes the past. The walk also gave us a chance to scope sites for watching tomorrow night’s fireworks extravaganza (Yeah. We’re a day ahead here.). 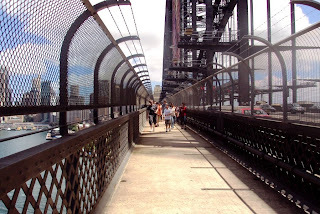 We got a little lost finding the pedestrian entrance to the Harbour Bridge, but we made it eventually. Preparations are underway on the bridge for tomorrow night’s show. Special platforms have been setup with boxes of fireworks and fuses. New Year’s Eve is in the air. 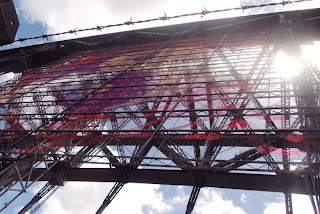 Once we made it into Sydney, we walked even farther out to Darling Harbour to check out the tourist trap there. We sat down at Lindt’s to iced chocolate and chai tea, which were both delightful. And hours after we left the house, we took the bus home. Exhausted. In any case, tomorrow is the bigger issue. It’s still unclear where we’re going to watch the fireworks to ring in the new year tomorrow night. But the plan is to leave as early as possible. On the ferry to the zoo, the guide said many people will be camping out tonight to ensure a good view for tomorrow night, and the people at the table next to us at Had to Happen Mexican Restaurant said they’d be heading to stake out their spot around 2:30 a.m. , 21.5 hours before the fireworks start. So I think we’ll be out of the house early tomorrow morning, but our destination is still unclear. I guess we’ll play it by ear. 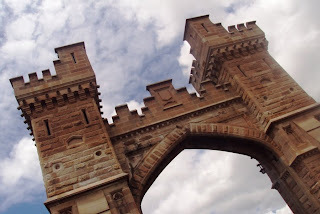 This bridge connecting Cammeray and Northbridge was constructed in 1828. 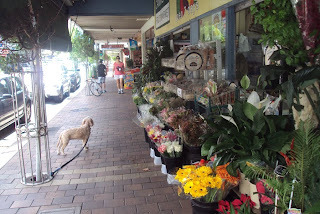 A storefront in North Sydney. The yin-yang symbol, which will play a prominent role in New Year's festivities. 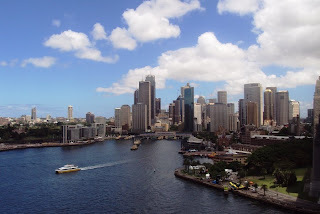 The Sydney skyline as seen from the Harbour Bridge. 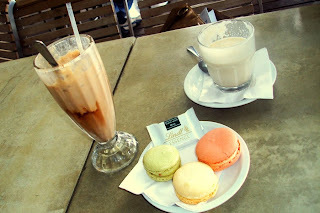 Iced chocolate, chai, and macarons (not macaroons) from Lindt's. You'll also notice a small wrapped chocolate square on the plate. I highlight the chocolate square because it was immediately familiar seeing as I have a ton in my freezer back in Samoa. 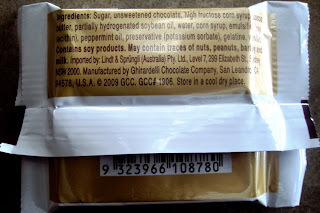 In the last shipment of Ghiradelli chocolate my grandmother sent, I got a bunch of Lindt's chocolates. I didn't even know what Lindt's was. But sure enough, when I turned over the chocolate square at the restaurant this afternoon, it was baked(?) at the Ghiradelli factory in San Leandro, California. What a small world. It's already past midnight in Australia.Happy New Year 2010! Of course you can celebrate two New Year celebrations in less than 24 hours if you were to go back to Samoa. 21 hours time difference between Sydney and Samoa. I wonder how New Year's Eve is celebrated in Samoa.